What Is the Value of Soybean Residue? Lincoln, Nebraska (December 13, 2018)--With the large number of soybean acres where residue was baled this year, we�ve received questions as to why the soybean residue is being baled and the value of that residue. This article answers the specific questions we�re receiving. What is the reason and use behind baling soybean stubble? Like other crop residues, soybean residue is used for livestock. Some use it for bedding as it isn�t as palatable as other crop residues. Others shred and mix it with distiller�s grains for livestock feed or use it as roughage if it is sold at a lower price than corn residue (and is available). There may be several reasons why we�ve seen an increase in baling of soybean residue this year. While we aren�t deficient in corn residue, the late harvest delayed baling of corn residue for some. Another factor may have been higher hay prices this fall that have only increased since. Livestock producers may have been looking for a forage alternative and crop growers may have been looking for some extra income. How much residue is produced? In general, the amount of crop residue produced is related to grain production. Approximately 1 ton of crop residue (at 10% moisture) is produced with 40 bushels of corn or grain sorghum (56 lb/bu at 15.5%), 30 bushels of soybean, and 20 bushels of wheat. If a corn field averages 240 bu/ac, it would result in approximately 6 tons of residue/acre. If a soybean field yielded 60 bu/ac, it would result in approximately 2 tons of residue/acre. What is the nutrient value of residue removed? The typical nutrient levels contained in various crop residues can be seen in Table 1. These are the nutrient levels removed from the field if the residue is baled. If the residue is grazed, the nutrients would be redistributed unevenly throughout the field. To determine the value of these nutrients, one would need to know the current fertilizer nutrient price per pound. Based on the research, it�s recommended to leave at least 2 tons/acre of residue in the field to maintain soil organic matter. More needs to be retained for many fields to prevent excessive sheet and rill erosion and there should be no harvest for some fields, especially if tillage is practiced (see NebGuide G1846). Residue removal is also expected to increase evaporative soil water loss. In the corn field example above, 6 tons of residue are available. Removing 2-3 tons of residue still leaves 50% or more residue on this field. In comparison, the soybean field with 2 tons/acre of residue at harvest is already at the 2 ton/acre limit to maintain soil organic matter. Regular soybean residue removal is expected to result in reduced organic matter and increased soil erosion. While judicious harvest of corn residue commonly results in increased yield for the following crop, we do not have evidence and do not expect such a benefit from soybean residue harvest. What is the feed value of soybean and other residues? Soybean residue is a lower quality feed than corn, sorghum, and wheat residue. That�s because of the higher lignin content of the stem that is not easily digested by microbes. Forage tests show a range of 35-38% total digestible nutrients (TDN) and 3.9-4% crude protein; these numbers are less than those for wheat residue. For comparison, forage tests from corn residue ranged from 47-54% TDN and 4.5-6.5% crude protein (sorghum residue would be similar). The highest edge of those ranges would be similar to average grass hay. Would the economics justify baling soybean residue? Table 2 shows reported survey numbers from the 2018 Nebraska Farm Custom Rates for cornstalk raking and baling. Soybean numbers aren�t provided in the Custom Rates so the cornstalk numbers are used for this example. USDA showed a price of $50/ton for soybean residue. Assuming 88% dry matter (DM) (and we are not confident that it would be that high), then that is $162 to $189/ton of TDN with 4% crude protein. 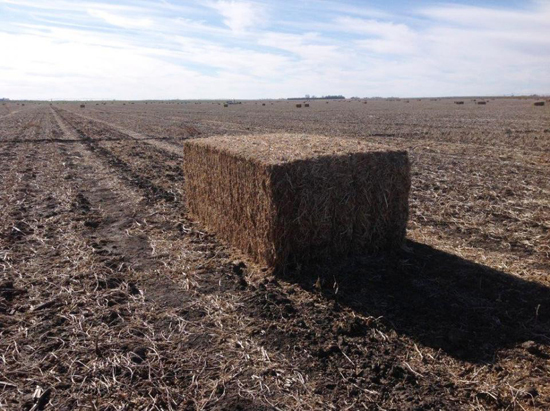 In comparison, corn residue bales were $60 to 65/ton. Assuming 83% DM and 50% TDN, corn residue is a better deal at $150 to $156/ton of TDN with 5-6% crude protein. For perspective, good grass hay is $85 to $100/ton. Assuming 88% DM and 55-60% TDN, it is $160 to $205/ton TDN. A true economic analysis would take into consideration the residue removal costs, nutrient removal, and potential for soil loss (even though it�s hard to put a value on that). As a source of dry matter, soybean stubble is a low-cost source of dry matter. However, soybean stubble is less valuable than both corn and wheat baled residue on an energy basis. The reduced feed quality and higher cost of the feed value doesn�t justify the economics of baling and feeding soybean residue for cow-calf producers. From a short-term and long-term soil productivity perspective, including for soil and water conservation, soybean residue removal is not justified for agronomic and economic purposes. Factors such as late harvest delaying baling of corn residue, higher hay prices, and opportunity to sell soybean residue may have resulted in more soybean residue baling this year. � Wortmann, Charles S., Robert N. Klein, and Charles A. Shapiro. 2012. Harvesting Crop Residues. Nebraska Extension NebGuide G1846.